SOMETHING strange is happening in South America. Two UFO sightings captured on film have sparked a frenzy online among sceptics and believers. The videos have raised questions about what the strange objects could be and why they’re populating the skies in the region. 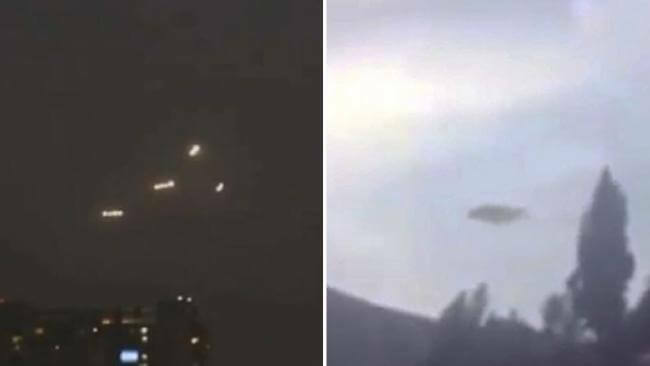 The latest sighting posted on YouTube called ‘Fantastic UFO sighting in Santiago’ shows a girl being startled by the sight of four glowing orbs hovering above skyscrapers in the Chilean capital. Again, the video which has been viewed thousands of times, has divided opinion on whether it’s genuine. Earlier this month, a giant flying saucer was captured above a rural neighbourhood in Bolivia — which is right next to Chile. The eerie footage shows a mysterious circular-shaped object flying in the sky which disappears and reappears in the clouds. It was sighted above mountains in El Alto — a city in the northwest Bolivian region La Paz. The video was uploaded onto a UFO-spotting website dedicated to collecting evidence of extraterrestrial life on Earth and has since been shared worldwide. People are debating whether the footage is real or not — with sceptics claiming it as a hoax to increase online traffic for a filmmaker’s website. Mexican newspaper Excelsior also claims the video is a fake and was made using a digital editing program. But other viewers are just as confused as YouTube user The white J Cole who is “not sure what to think of this one”. Could this be the most conclusive footage yet of extraterrestrial life on Earth? You decide.